We are starting a new project within the framework of On Mediation. Training seminar on curatorial theories and practices, focused on a Workshop on Critical Writing. This workshop will underscore the paradoxical nature of critical activity as a new mediation process. Under this point of view, we understand critical writing in the interspaces between visuality and verbality, between interpretation and judgement, between theory and empiricism, between subjectivity and normativity. Coordination: Rosa A. Cruz + Olga Sureda. Organization: Universitat de Barcelona i Arts Santa Mònica. With the support of ARTS SANTA MÒNICA. Sessions linked to the theoretical phase of the seminar OM/4. “Torrent Echidna Attractor. La raresa de la matèria“, Lucía Marcote for Núvol. “«Radical Video», la experimentación a todo color de Nam June Paik“, Núria Gurina for ABC Cultural. “En la trinchera (del MACBA) con Martha Rosler“, Susana Pardo for ABC Cultural. “Navia, tras las huellas de Cervantes, ahora en Barcelona“, Susana Pardo for ABC Cultural. “Lucía C. Pino: Cuando los objetos nos llaman“, Ana Valenciano for ABC Cultural. The critical exercises done by the participants will be supervised by the coordinators and director of the workshop. 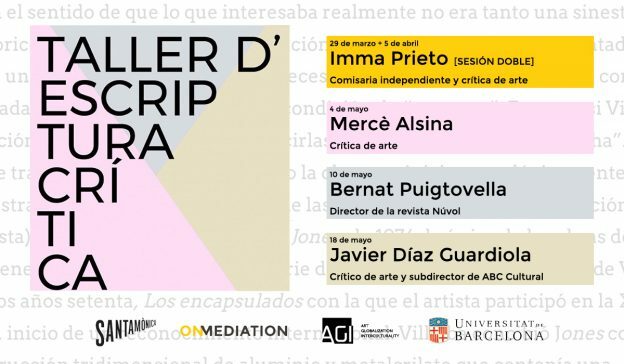 Addressed on the ongoing exhibitions at Arts Santa Mònica, the exercises will be published in one of the proposed platforms. Arts Santa Mònica exhibitions: Llegible-Visible. Entre el fotograma i la pàgina. Until May 28th / Miguel de Cervantes o el deseo de vivir. José Manuel Navia. Until May 21th / (Re)visionats, (re)visitats. LOOP. Until May 28th / Joan Morey. Cos social (Lliçó d´anatomia). Until June 16th. Candidates to the Workshop on Critical Writing will be assessed taking into account attendance to the previous sessions with this independent curator and art critic. Candidates must send a CV and a short letter of motivation to onmediationinfo@gmail.com and fill the registration form. Tuition fee: 50€ students, 60€ non-students.